Eric here catching you up to date on the travels of Still Waters II. 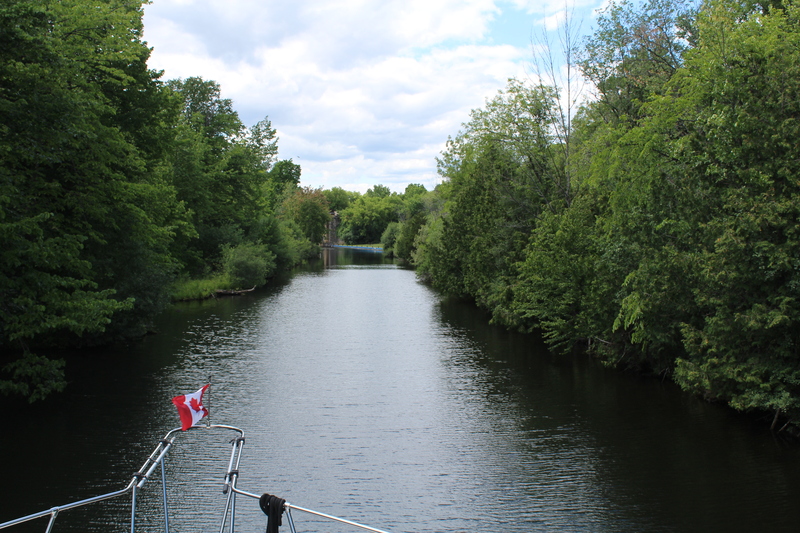 This week the crew has completed their journey of the Rideau Canal. The crew has also made a quick trip back to Texas to celebrate the adoption of 4 new grandkids. Click on the Travel Map above to see the day-to-day travel log. Also, a hearty Welcome Aboard to marcoislandmm3 and oralierice1604 who have joined us as virtual crew members. In addition, the crew also had a couple of real crew members join them for the week. Jessica Rogers and Mel Torres caught up with the crew in Smiths Falls and traveled onboard a few days before de-boarding in Trenton. 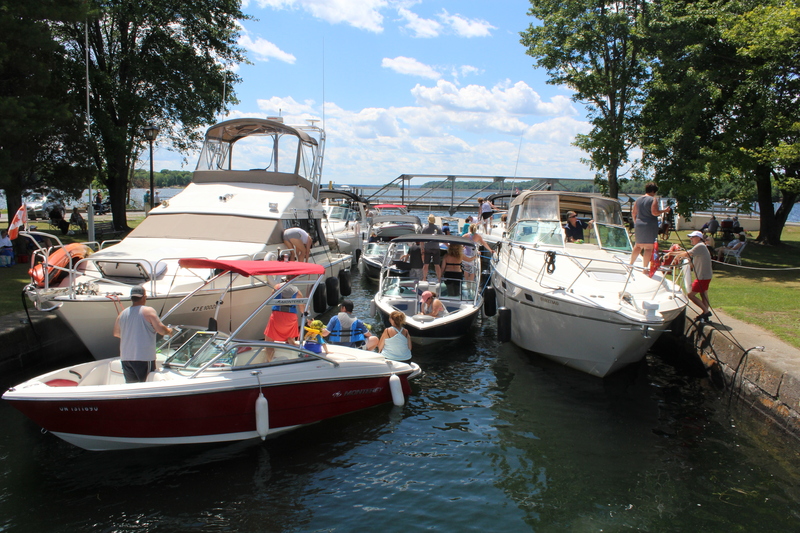 Sunday, July 3, the crew needed to take on fresh water and pump out the holding tanks before setting sail, so they pulled over to the town dock and took care of business. With those duties completed the crew and their two new passengers set sail for the Narrows Lockstation. As they first took off the skipper began training the newest crew member in the ‘qualifications’ to pilot the boat. The first qual is Lookout. The skipper explained the function of the lookout and rules of the road for the ‘give way’ and ‘stand on’ vessels in passing situations. During the lesson several boats appeared, which presented an opportunity to identifying vessels and apply the passing rules. With these lessons mastered, they moved on to the second qual, Navigator. The skipper explained the navigational aids and how the navigator works with the person piloting the boat. The helmsman watches the chart plotter, engine gages, and steers towards the next navigational aid. The navigator looks at the charts to identify the upcoming navigational aid and then finds the marker in the water. Then the navigator points out to the navigational aid to the helmsman. After practicing the navigation skills for a while the new crew member was ready to pilot the boat. 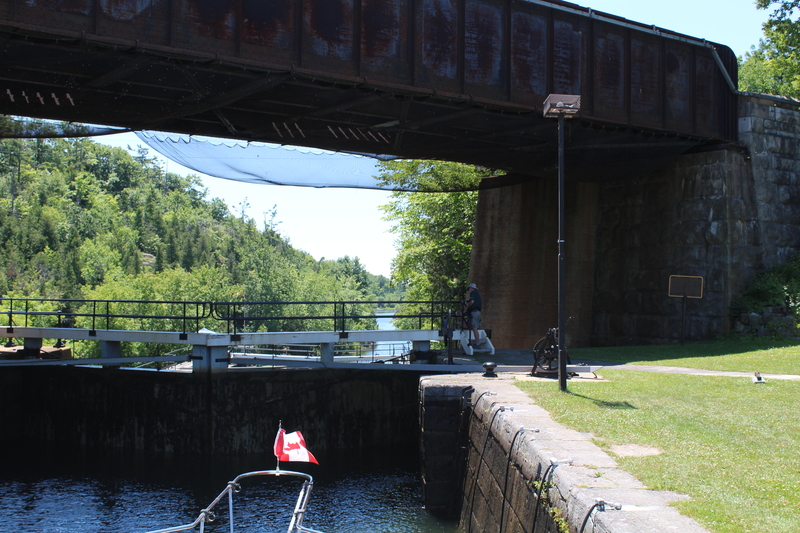 Mile 60.5, The crew gave the new passengers some on-the­-job training as they locked up the final Smiths Falls Lock for a rise of 8 feet. 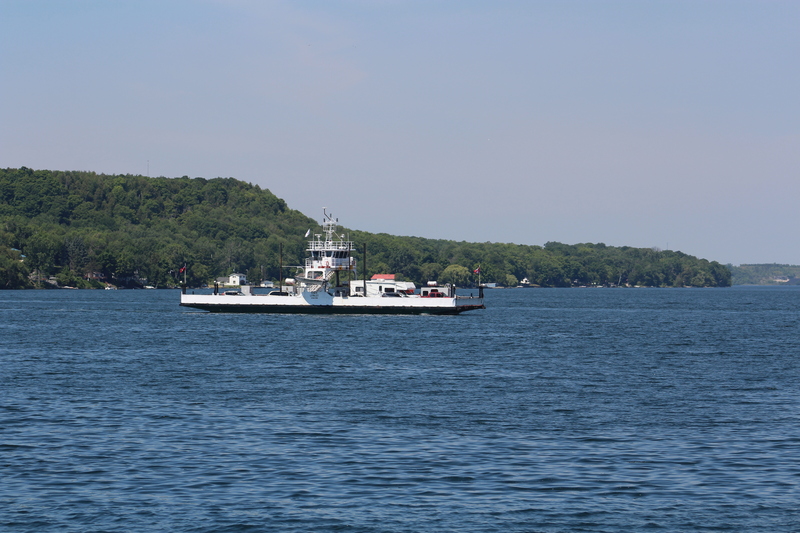 Mile 62.8, The new passengers took over the locking duties and worked the boat up the Poonamalie lock for a lift of 6 feet. Mile 82, The crew docked below the Narrows Lockstation for the day. 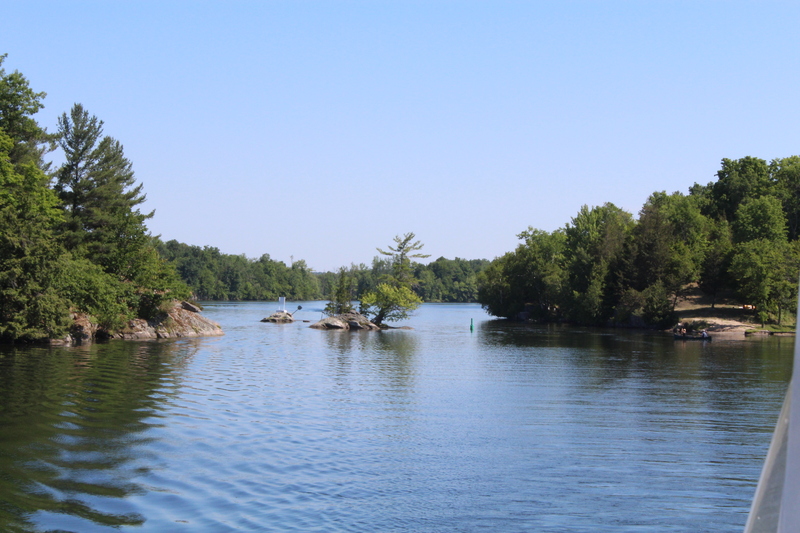 The Narrows Lock was added to the system to raise the water level of the Upper Rideau Lake three feet. This allowed flooding swamp land that was causing malaria in the workmen building the canal. Monday, The crew had a short day so they did not leave until 1000. 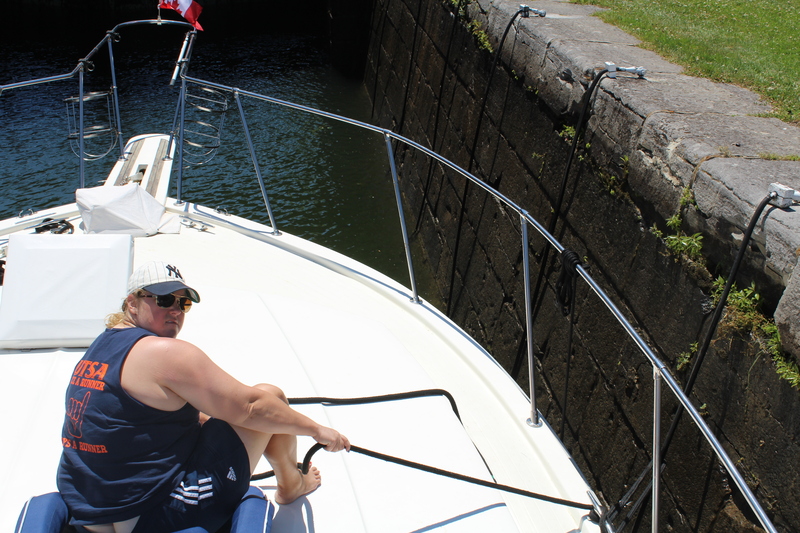 After making the 3 foot rise in the Narrows Lock, Still Waters II was at the highest water level of the Rideau Canal. This means that the locks from now on will start to drop the boat back towards sea level as they approach Kingston. Mile 87, Newboro Lockstation dropped the boat 8 feet. The new passengers are starting to be productive crew members. Mile 92, Chaffeys Lockstation lowered the boat 11 feet. Mile 94, Davis Lockstation lowered the boat 9 feet. Mile 98.8, Jones Falls Lockstation initially lowered the boat 14 feet. Then after moving a whole .1 mile the crew entered a flight of three locks that lowered the boat 45 feet. After exiting lock 42, the crew motored across the water and docked at the Kenney Hotel for the night. While locking thru the Jones Falls lock, the crew started talking with the crew of a pontoon boat. The two couples asked if they could come aboard after docking and the Still Waters II crew said yes. The two couples on the pontoon boat are seriously in the boat buying mode and wanted to see Still Waters II. One of the men who came aboard was a minor league hockey player and NHL Referee. It is just amazing who the crew meets out on the water. Tuesday, The Float Plan for the day was to go to the Brewers Lockstation and then decide to stay or go on to Kingston. Upon arrival at the Lower Brewer Lockstation, all the mooring spots were taken so it was an easy decision to go the remaining 14 miles to Kingston. 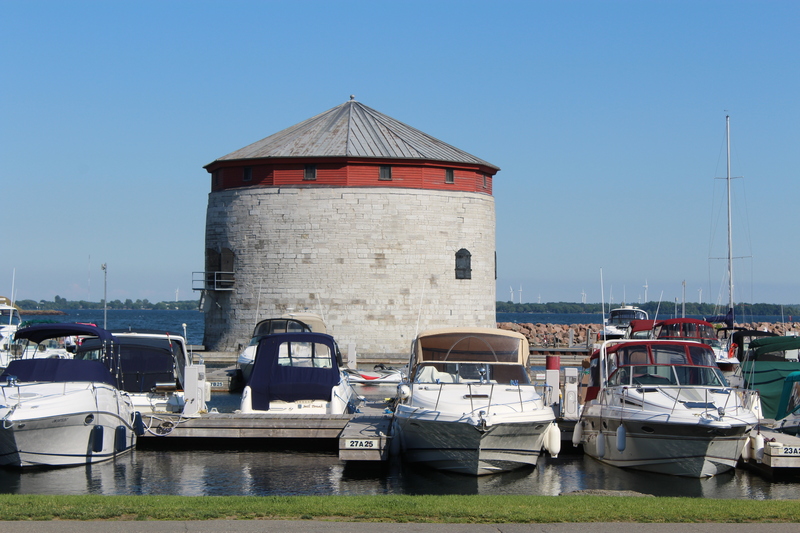 The skipper phoned the marina and made reservations, while the crew handled the lock. Mile 105, Brass Point Swing Bridge had to be opened to allow passage into Cranberry Lake. Mile 110, Upper Brewers Lockstation (43/44), down 18 feet. Mile 111, Lower Brewers Lockstation (45), down 14 feet. The Washburn Swing Bridge also had to be operated to allow passage thru the bridge. Mile 113 to 121, Crossed Colonel By Lake. Colonel By was the man in charge of building the Rideau Canal. After completion of the Canal he returned to England to face charges of misappropriation of funds while building the canal. He was eventually exonerated, but the trials and accusations tarnished his otherwise excellent career. He resigned his commission and died in obscurity. He would be shocked today to learn that the town he created (Bytown) to be the headquarters for canal construction is now named Ottawa and is the head of the Canadian government. He would also be surprised to find a lake named after him. All along the canal there were many tributes to the engineering obstacles he had to overcame to build the canal. Mile 121, Kingston Mills Lockstation (46), down 10 feet. Also, Kingstone Mills Swing Bridge had to be opened to enter the lock. Upon arrival at the lock, there were a few boats locking up so Still Waters II tied to the blue line to wait her turn to enter. The swing bridge was opened to allow the boats to leave the lock. The lockmaster came over to the skipper and informed him that they would close the bridge and allow traffic to pass due to the number of cars that were backed up. After allowing the cars to pass over the bridge, the bridge was reopened and Still Waters II was allowed to enter the lock. Mile 121.2, Kingston Mills Lockstation (47/48/49), down 38 feet. This flight of three locks had a very impressive view when looking down from the top. 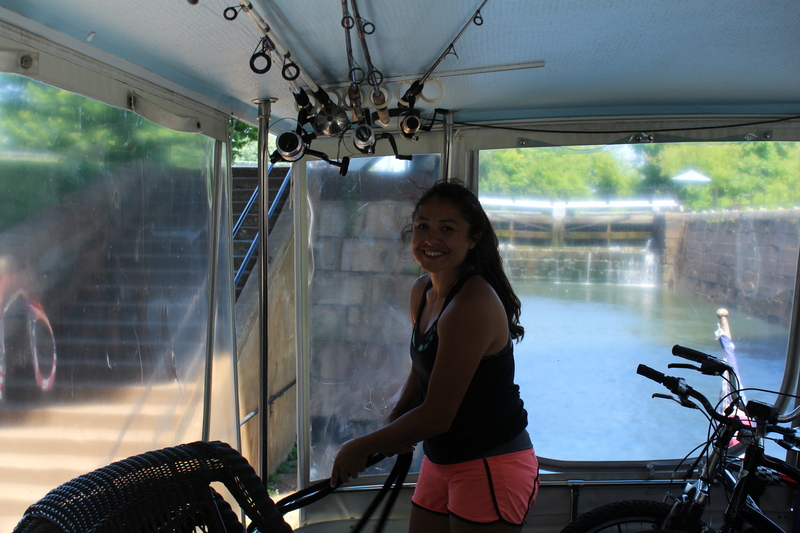 The crew was glad to finally have all the Rideau Canal locks behind them. Mile 125.5, The last obstacle for the day was getting past the LaSalle Causeway Bridge. The crew was targeting the 1500 opening. The channel from the Kingston lock to the bridge was very narrow. Barely enough room to allow passage of two boats. A seat cushion which was up on the bow was caught by the wind and blew overboard into the water. Once it was discovered that the cushion was missing, the crew spotted the cushion in the water. However, the wind had already blown it out of the channel which would mean some tricky navigating to try and recover the cushion. Also, because of rush hour traffic, there is no 1600 or 1700 bridge openings. If an attempt was made to fetch the cushion, the crew would have to bob in the water for three hours for the 1800 bridge opening. The skipper decided the risk rewards payoff was not worth fetching the cushion and made the 1500 bridge opening. Mile 126, The crew docked in the Confederation Basin Marina. The crew was assigned slip BW 09 which was going to take a stern in approach in crosswinds. There was also another boat already in the adjoining slip so it was going to be a tight fit to back in the slip. Another sign that this was not your ordinary landing was the fact that the marina sent 4 dock hands to help the crew dock. The skipper managed to get the stern over towards the dock and the crew tossed a breast line over to the dock hands. The dock hands got the line cleated quickly which allowed the skipper to back the boat into the slip with no issues. Good job to all the crew and dock hands. Wednesday, the crew took an early wakeup call and shoved off from the dock about 0700. The float plan was to make the run from Kingston all the way to Trenton. The run would be about 8 hours and the crew wanted to have time to look around Trenton before the town closed up for the evening. After running near idle speed for much of the Rideau Canal, there was much carbon build up on the engine exhaust to burn off. To burn the carbon build-up off, the skipper put Jessica behind the wheel and brought the boat up to full speed. Still Waters II got up on plane and cruised at 18.5 knots (21.3 mph). Initially, the exhaust was smoking pretty bad, but after a while the hotter exhaust burned the carbon off and the smoking stopped. The boat stayed on plane until the crew approached a bridge. They brought the speed back down and idled under the bridge. The crew then spent another hour or so cruising and arrived at the Port Trenton Marina. Thursday, the crew finally decided that they would make the trip back to Texas to join in the Adoption Celebration. The crew’s daughter and son-in-law have adopted a sibling group of 4 young children to join the existing 4 bio kids. The adoption is complete and a party to celebrate is scheduled for Saturday in Bryan, Texas. A rental car was obtained in the morning, and the crew drove their guests to the Toronto airport. After dropping the guests off, the crew headed south for a long trip to Texas. Friday, the crew made it to Nashville about 0300 and decided it was time for a few hours of sleep. When the sun came up the skipper woke up and they were back on the road. The crew had not told anyone they were headed to Texas so they decided to have a little fun in making the announcement. That a black rental car left Ontario yesterday and has now been spotted in Memphis, Tennessee. The crew finally arrived in Bryan around 1900. Saturday, the crew spent a wonderful day celebrating the addition of the 4 newest family members with family and friends. 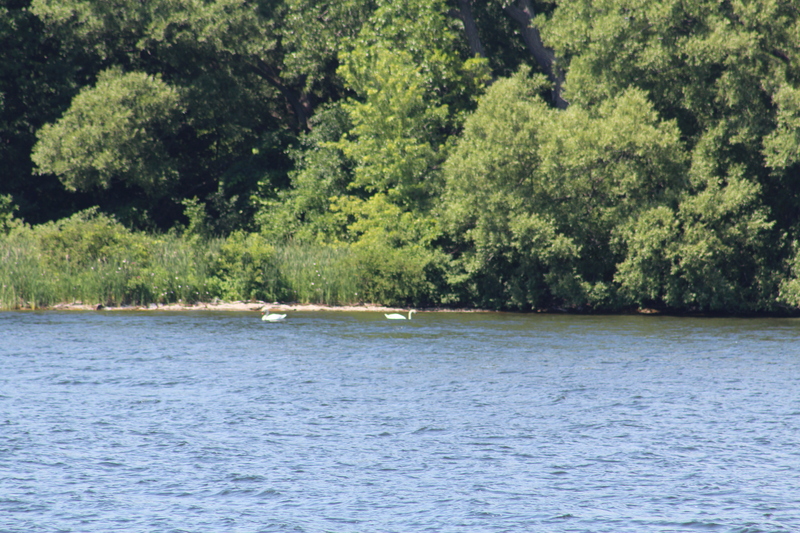 The crew will spend the first part of next week making their way back to the boat in Trenton. After returning to the boat the crew will make final preps and then start the Trent-Severn Waterway. Come back next week to see how the adventure continues to unfold.